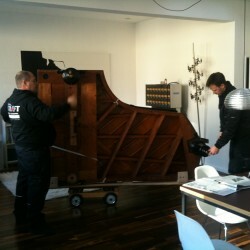 Today the grand piano arrived ! Someone got his hands on this great instrument and had no use for it. She gave it to a friend, who happened to get another grand piano. He passed it on and today it arrived at Hedgehog Recorders.